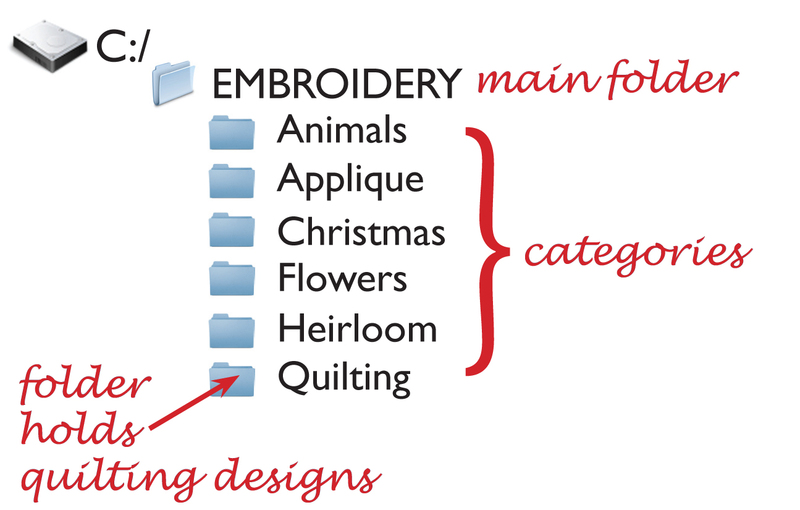 With so many embroidery designs available digitally, and countless free designs offered online, it helps to have a plan when it comes to organizing them all. The task can seem daunting, but getting started is really the hardest part. Remember when you had to create an outline in school? This is much the same. Create folders on your computer or storage device (a portable hard drive or jump drive) to organize designs in a way that makes sense to you. Folders work like a filing cabinet, allowing you to group design files within categories (sub-folders). The main folder is home base, the physical filing cabinet. It is the top-most storage area from which all other sub-folders originate. 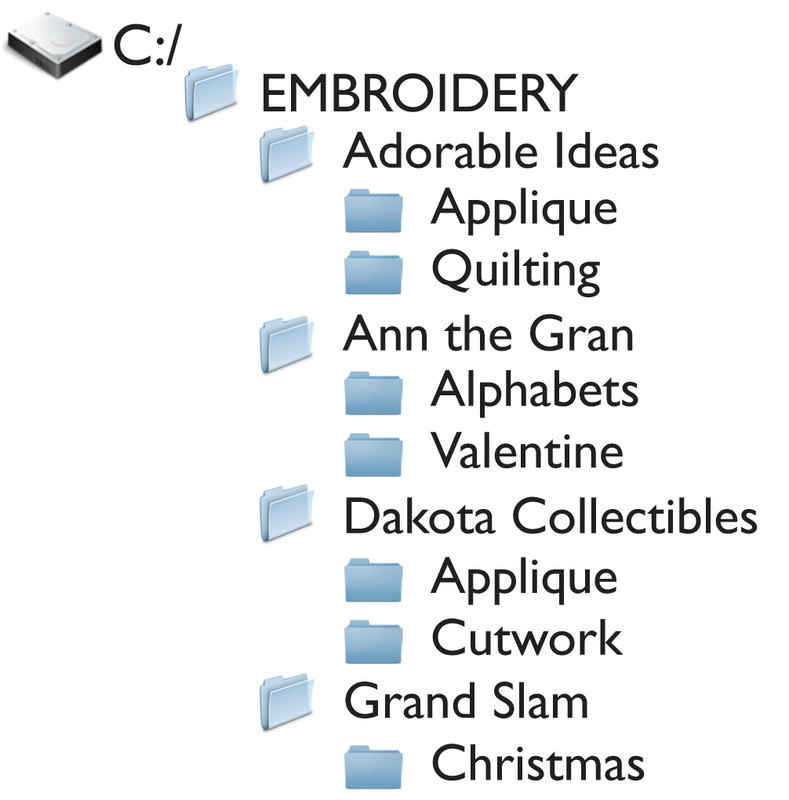 Create a main folder on your computer hard drive (C:), or portable storage device, and give it a name such as Embroidery. 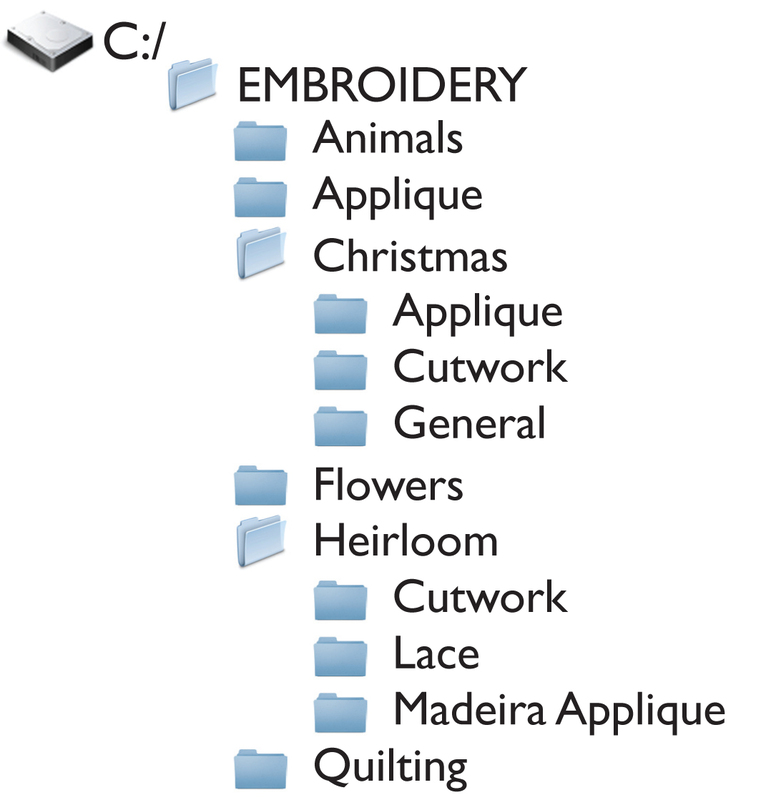 Create folders under the Embroidery main folder for major categories, such as Applique, Christmas, or Heirloom. Start basic and get more specific as it makes sense. You can always change, move, create, or delete files and folders later if desired. 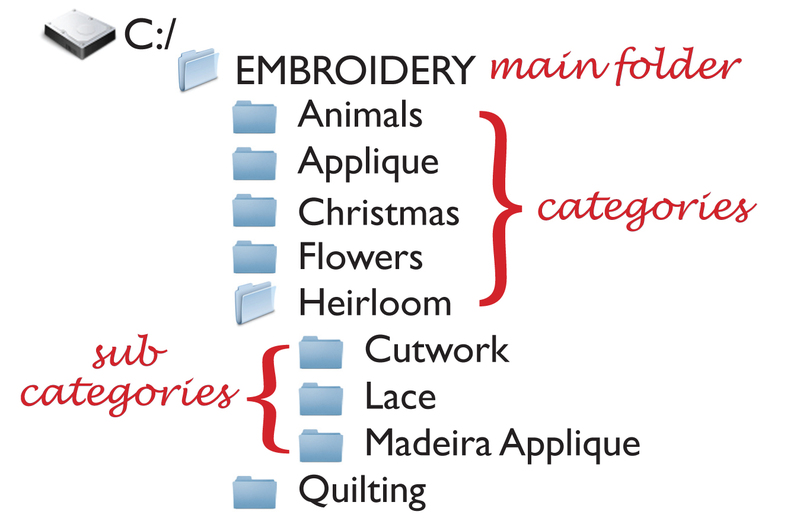 Where you have similar groups of designs within categories, create subfolders. For instance, if you have a large number of heirloom designs, separate them even further with subfolders named Lace or Cutwork under the Heirloom folder. What if you have Christmas cutwork designs? Do you put them under the Cutwork subfolder of the Christmas folder or the Cutwork subfolder of the Heirloom folder? It depends whether or not you want to look in one place for all cutwork designs or all Christmas designs. There isn't any reason you can't put them in both places. That way, no matter where you look you will find cutwork designs. Alternately, you can group files by manufacturer. 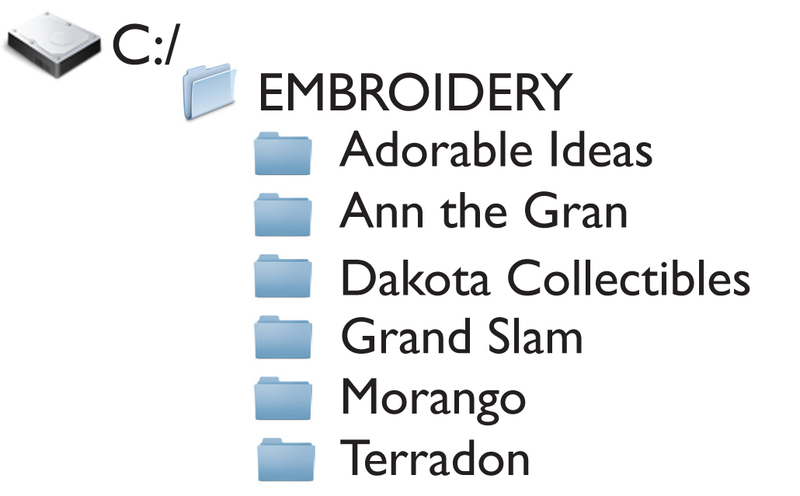 If it is easiest for you to remember you purchased designs from Ann the Gran or Dakota Colletibles, then make Ann the Gran and Dakota Collectibles folders and create subfolders for different types of designs in each of these categories, such as Alphabets or Applique. It's entirely up to you. You may even group files both ways, by type and manufacturer. If all of this sounds too intimidating, cataloging programs like CatalogXpress have the categories built in for you. You can use them or create your own. There aren't any rules. Ways of organizing design files are as individual as the types of designs we all buy. As long as it makes sense to you, and you know where to find the files you want when you need them, it's all good! You should be able to go up to your browser bar and click "File" then select "Print." I have catalog xpress and I love it, except.... (isn't there always an "except"?) I keep my designs on an external hard drive, when I plug it into my computer, even if it is in the same USB, the identifying letter (f, e, d, etc.) always seems to change. When it changes catalog xpress cannot point to it. Can this be changed? Just a thought for you developers out there. I don't know enough about Catalog Xpress. and I'll bet you will get some helpful tips!